This very cool Medical ID bracelet for kids is perfect for children between the age of 2 and 8. 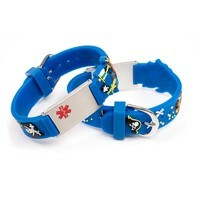 The ID bracelets can be of great value in case of emergency. First responders can give your child the best care possible. Peace of mind wherever you go. On the front there is space for 2 text lines or one larger word. We suggest to always include a phone number, allergy information and crucial medication onto the ID tag. Make sure the wristband is not worn to tight. Some space between the skin and the bracelet is necesarry and always dry off after swimming, bath or shower. This will preserve the quality of the bracelets and ensures it will not stick to the skin. 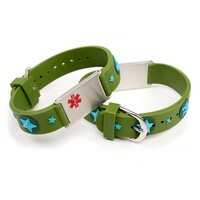 Medical ID bracelet for kids come in many colors and designs.